Venetia Walkey is a sculptor and peace builder. She was bom in Hampshire , England in 1932. She studied Fine Arts at Medway College of Art, and Scupture at Guilford College of Art. Since 1970 she has lived and worked in Thailand. Venetia Walkey studied informally with Professor Kien Yimsri, Dean of the Faculty of Sculpture and Painting at Silapakom University, Bangkok. She studied Buddhism, meditation and yoga. Her initial inspiration was to communicate Buddhist teachings via small unorthodox bronze sculptures, classified officially as religious works of art. Her exquisite artwork has shown in exhibitions in Europe and Thailand, in both private and public collections. 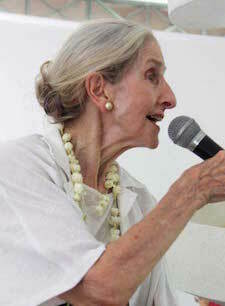 Venetia Walkey is also the creator and director of The Dhamma Park Foundation and director of the Dhamma Park Gallery, a contemporary center for the development of spirituality and the arts in Pasang, Lumphun, Thailand . Dhamma Park Gallery opened in 200. The permanent collection of modem sculptures represent the core teachings of the Buddha. Venetia Walkey explores new ways to raise Spiritual and Environmental Awareness and to encourage ethical values essential for the true well being of society, via the study and practice of the Buddha, Dhamma, Humor, Satire and the Arts. At Dhamma Park she offers peaceful space for reflection on the real meaning and purpose of life and opportunities for everyone to have fun in the Dhamma. Venetia Walkey believes that Artists who are concerned by the current destructive thrust of human culture, have a valuable role to play in helping to bring about a Global Spiritual Reintegration and in relieving the Spiritual Energy Crisis by reflecting Goodness, Truth and Beauty in their work. She finds great inspiration for her work in the Northern province of Lumphun, Thailand with her partner and President of the Foundation of National Thai Artists, Inson Wongsam. In her spare time she writes poetry, listens to classical music, reads widely, and listens avidly to the BBC and other overseas radio programs. The Dhamma Park Foundation is affiliated with the International Network of (Socially) Engaged Buddhists (INEB), the Spirit in Education Movement (SEM), and Alternatives to Consumerism (ATC). It is an official partner in UNESCO's program for building Cultures of Peace and Peace Education. Also, Venetia Walkey has published a paper on Buddhist Arts for Contemporary Society.